We’ve discussed one well-known way to cook eggs before. (Repeatedly!, In scientific detail!) 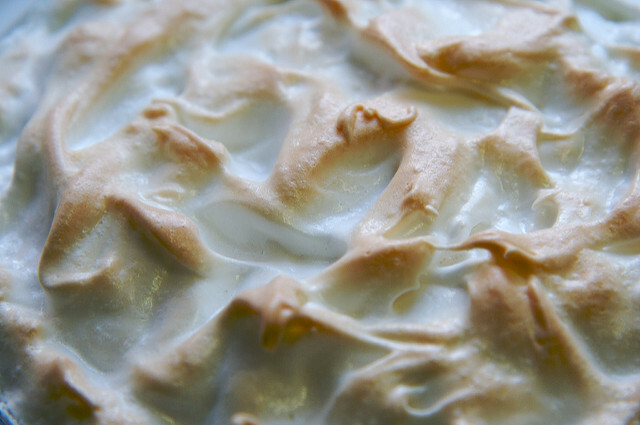 As a quick guest post, I thought I’d mention a somewhat more exotic way to cook eggs – meringue. In its simplest form, a meringue is simply egg-whites with sugar, whipped into a foam and baked gently until it hardens. 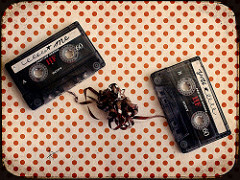 The end result can take a range of forms. It can be a squishy, wet foam like the top of lemon meringue pie. It can also be a dry, fluffy substance that crumbles to powder and dissolves when you eat it. Just four basic things determine the final form of the meringue: the egg-white proteins, the sugar, water, and heat. Making foam for meringue by whipping egg proteins has a lot in common with making dough for bread by kneading wheat proteins. In both cases, the physical whipping or kneading stretches out the wadded-up proteins into long strands. These strands stretch out next to each other and the amino acids in them stick to each other. 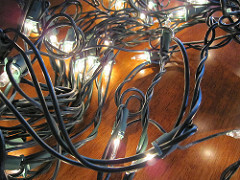 This might be compared to tangled strands of Christmas lights! These stuck-together strands then provide a stronger structure for air-bubbles to be trapped in, and helping the cooked product hold together without collapsing. This is also the reason why you can only use egg whites instead of whole eggs – egg yolks contain fats and emulsifiers that effectively “lubricate” the protein strands and keep them from sticking together at all! The sugar and water act together. The sugar is not only there to make the meringue sweet. “Table sugar”, scientifically referred to as “sucrose”, has a natural tendency to absorb water. The fancy science word for this is “hygroscopic”. In meringue, sugar helps pull water molecules away from the egg-white proteins and helps them stick together even better. It also helps hold onto some water during baking, so that the meringue stays soft enough to be edible. Meringues are usually baked slowly at lower temperatures than, say, cookies or bread. The slow, gentle cooking dries the meringue to make it crispier without over-cooking the egg proteins. It also avoids carmelizing and burning the sugars. Because the sugar is hygroscopic, keep cooked meringues as dry as possible. The sugar will absorb moisture from the air into the meringue, making it chewy and forming sticky drops on the outside. If you’d like to make this tasty tangled protein treat yourself, here is one simple, basic recipe, among many others available online!